Adolescence is a time of rapid growth, change and development. With obesity and chronic disease on the rise, teenage boys should eat a balanced diet to ensure proper growth but also to maintain their optimum weight. A teen's calorie needs are based on many factors including body size, rate of growth and activity level. The Dietary Guidelines for Americans 2010 recommends that boys between the ages of 9 and 13 get between 1,400 and 1,600 calories per day if they are sedentary; 1,600 to 2,000 calories per day if they are moderately active; and 1,800 and 2,200 if they are active. Recommendations for boys ages 14 to 18 are 2,000 to 2,400 calories if they are sedentary; 2,400 to 2,800 calories per day if they are moderately active; and 2,800 to 3,200 calories per day if they are active. Calories should come from a variety of fruits, vegetables, grains, dairy and protein. Carbohydrates, found in fruits, veggies, and grains, should make up 45 percent to 65 percent of a teenage boy's daily calories. Protein, found in meat, poultry, fish, and beans, should make up between 10 percent and 35 percent of total calories. Teenage boys ages 9 to 13 need 34 grams of protein per day; ages 14 to 18 require 52 grams. The remaining 20 percent to 35 percent of daily calories should come from healthy fats. 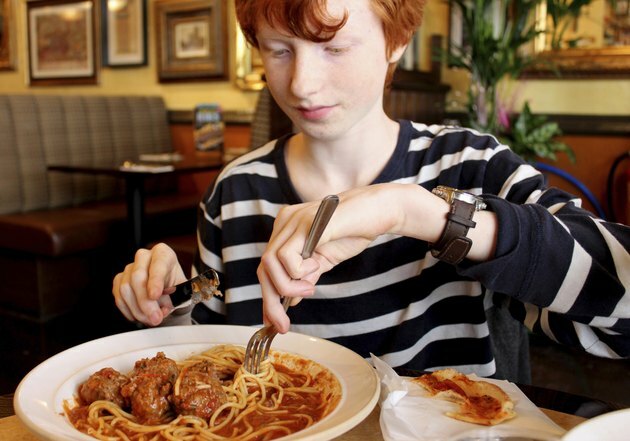 Kids Eat Right: How Many Calories Does My Teen Need? How Many Calories Should a Teenage Girl Have Each Day?